3. If you do feel drowsy, what you must do to stay alive - and this is the simple bit - you must stop as soon as possible and take a 15 minute "power nap". 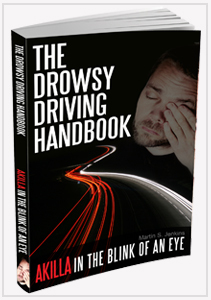 This book also dispels some drowsy driving myths. It tells you what things won't revive you when you are feeling drowsy. A compact, easily understood book that presents clear educational messages that everyone should be aware of before driving. This passport sized book readily fits into your pocket, handbag or glove-box.